by direct funding, by partnering with others, and by programming. The Missouri Arts Council has long recognized the value of a strong arts education and the corresponding impact on the state: better educated students, more effective workforce, and economically vital communities. Unlike many other states in the U.S., Missouri has consistently maintained requirements for students to study and experience the fine arts in its public schools. With this in mind, the Missouri Arts Council’s grants for Arts Education support exposure to the arts, discipline-specific sequential learning in the arts, and the integration of the arts with other classroom subjects. Our Arts Education program extends beyond these grants through partnerships with the Missouri Department of Elementary and Secondary Education and the Missouri Alliance for Arts Education. Resources are committed to strengthen the position and impact of fine arts specialists, improve student achievement through arts integration, develop teaching artist’s skills and opportunities, and support the development of quality community arts education. The Missouri Arts Council offers three different grant programs for K-12 schools: the Big Yellow School Bus Grants, the Touring Express Strategic Grants, and the Express and Annual Arts Education Program Grants. (In some cases eligible organizations may apply on behalf of the school.) Schools are limited to receiving three grants, one from each category, within the fiscal year of July 1-June 30. The Big Yellow School Bus Grant helps schools meet the transportation costs of educational field trips to arts institutions and activities in Missouri that are funded by the Missouri Arts Council. Eligible activities include art museums, festivals, exhibitions, and performances of music, dance, and theater. Experiential learning at cultural institutions is critical to a child’s academic development. These visits help foster creativity and innovation, among the most important skills for students to develop today. Big Yellow School Bus is designed to foster partnerships between schools and art institutions so students across the state can explore and experience all that Missouri’s cultural life has to offer. The maximum request amount is $300. No match is required. Each school is limited to one Big Yellow School Bus Grant each year. 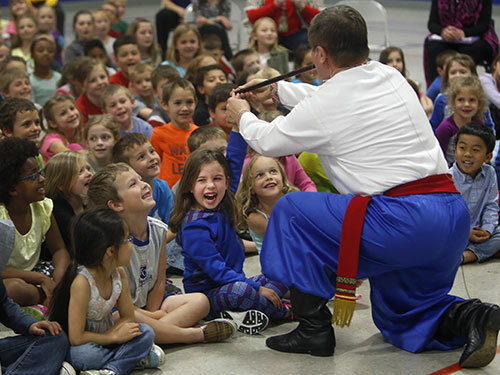 The Touring Express Strategic Grant funds 60% of artistic fees for schools and organizations to present performing artist(s) at assemblies and may include pre/post educational workshops or related activities. Performing artists must be listed as “school touring qualified” on the Missouri Arts Council’s Directory of Missouri Touring Performers. Programs provided through the catalogues of Kansas City Young Audiences and Springboard (St. Louis) are also eligible, provided that the artist(s) reside in Missouri. 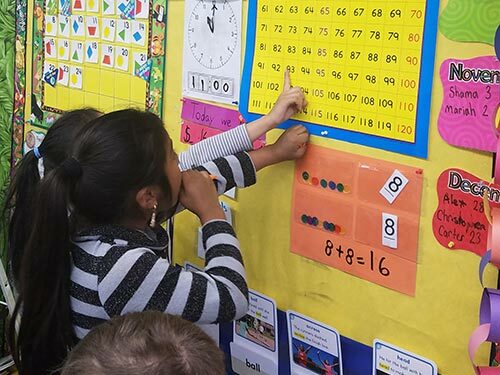 The maximum request amount is $3,000 per organization or school district, $1,000 maximum per school, with no more than one application per fiscal year. A 40% cash match is required. Multiple performances can be included in the application. Any school may receive one of these grants each year. Eligible projects are planned, organized, and implemented by a committee which could include teachers, teaching artists, representatives from partnering organizations, administrators, students, parents, and/or community members. The committee coordinator oversees all activities and serves as contact person for the grant. Applications must identify target groups of students, include specific arts learning objectives, and provide a quality assessment and evaluation plan. These grants must be matched dollar for dollar. Applicants may use any school administrator or teacher time spent on the project as part of the cash match. Within the school year any school may receive one Arts Education Program grant, whether awarded on the annual or monthly application cycle. Artist in Residence is designed to strengthen school fine arts curriculum (dance, drama, creative writing, music, and visual arts) or for integration of arts subjects with other curriculum (such as communication arts, social studies, math, or science). A residency must include direct, hands-on experience between the visiting artist and target and exposure groups. Residencies integrating fine arts content into non-arts curriculum should align studies in the fine arts with relevant themes taught in non-arts classrooms. Out of School supports quality arts education activities serving at-risk, urban and/or rural underserved children and youth. These activities should take place outside of the normal classroom day, and could occur outside of the school building. Applicants must demonstrate how participating students lack access to arts education due to geography, economic conditions, ethnic background, or disability. Professional Development supports arts learning opportunities for teachers, school administrators and teaching artists. The grant pays fees for qualified facilitators/speakers to lead instruction in teaching the arts and for integrating the arts into non-arts curriculum. The Missouri Arts Council has long recognized the value of a strong arts education, and the corresponding impact on the state: better educated students, a more effective work­force, and economically vital communities. The Missouri Alliance for Arts Education, with the assistance of the Missouri Department of Elementary and Secondary Education and the support of the Missouri Arts Council, has created two studies that analyze the relationships in Missouri school districts between student participation in fine arts courses (music, visual art, theater/drama, and dance) and attendance and graduation rates, disciplinary infractions, and statewide tests in language arts and mathematics in the Missouri Assessment Program (MAP). The first study was published in 2010: Arts Education Makes a Difference in Missouri Schools. 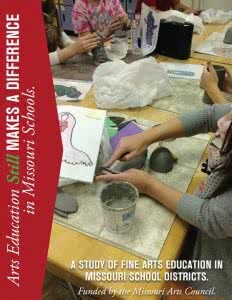 The follow-up was published in 2015: Arts Education STILL Makes a Difference in Missouri Schools. You can download the complete studies as 32-page PDFS and the key findings in two-page summaries. The reports reflect our unequivocal belief: every child benefits from art in their education. These reports underscore, once again, the unique and complex benefits of the arts.